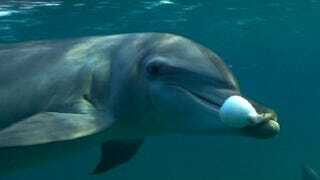 Using a remote-controlled camera disguised as a sea turtle, marine biologists watched as young dolphins got themselves stoned by ingesting a nerve toxin released by puffer fish. And as if sharing a joint, the dolphins could be seen passing it around. Puffer fish, when provoked, protect themselves by releasing a nasty toxin that can be deadly. But the dolphins appear to have figured out how to make the fish release it in just the right amount. After chewing on the puffer fish and passing it around between one another, the dolphins appeared to enter into a trance-like state. "[T]hey began acting most peculiarly, hanging around with their noses at the surface as if fascinated by their own reflection," noted zoologist Rob Pilley. "It reminded us of that craze a few years ago when people started licking toads to get a buzz, especially the way they hung there in a daze afterwards. It was the most extraordinary thing to see."